Vic Mensa’s career has been an interesting one. After leaving the band “Kids These Days”, of which he was the lead singer/vocalist, Mensa decided to start a solo career as a rapper. In 2014, he was chosen to be a XXL freshman along with Chance The Rapper, Kevin Gates, Ty Dolla $ign and others. Mensa had a big 2015 as he was able to work with Kanye West on the songs “Wolves” and “U Mad’. He also signed to Jay Z’s label, Roc Nation. Since then he has released an EP titled “There’s A lot Going On” and a full-length album, “The Autobiography”. With Mensa facing criticism for comments he made about the late rapper XXXTentacion, along with the low sale number of his album “The Autobiography”, it started to feel like Mensa needed to drop some dope music in order to counter all the negativity. In comes “Hooligans”. 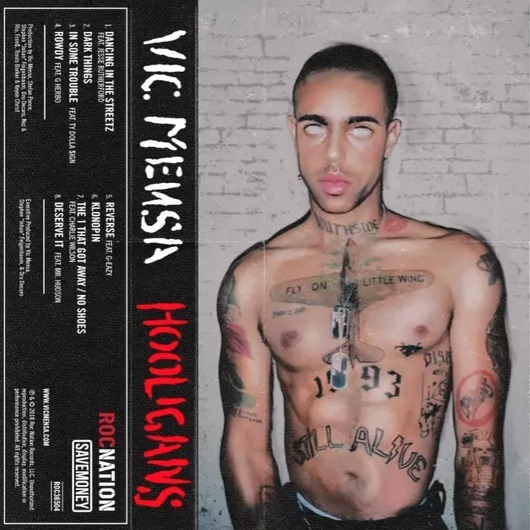 As a long-time Vic Mensa listener, I can definitely say that this project is different from any other music I’ve heard from him. Mensa is the true definition of an artist so it’s not shocking to me that his sound changed for this EP; however, I’m curious if he did this because of pressure from the new wave of rappers. Nonetheless, I feel that he did a good job. His sound is more current without leaving behind the lyricism or themes that give the music depth. The song “Dark Things” is amazing to me for many reasons. It shows Mensa’s ability to make a song that fits in perfectly with today’s sound while still containing substance. It doesn’t feel like he intentionally tried to make a current sounding song and it doesn’t feel like he was faking it. It is organic and it sounds like it is straight from his heart. The songs “In Some Trouble” and “Reverse” are both dope as Mensa pairs himself with two artists that I hadn’t really pictured him working with: Ty Dolla $ign and G-Eazy. Both of them compliment the songs extremely well. Ty’s smooth vocals go great with Mensa’s singy-rap and G-Eazy’s way of rapping makes for a bright feature. Both of these tracks are catchy and could easily be played on the radio while still being lyrical and full of substance. The one bad song in this project, in my opinion, in the song “Rowdy”. Mensa released this song before the EP dropped and I will admit it made me really nervous to listen to the project. The song is the opposite of “Dark Things” as it really sounds as if he tried super hard to make a song similar to what the “mumble rappers” are making. It’s very simplistic and doesn’t have much to say. It may have some replay value in the right setting, but for me, it’s the worst song on the EP. Overall, this project shows me that Vic Mensa is able to adapt and produce under societal pressure while staying true to himself. My fear was that he may sacrifice lyricism and artistry for sales but thankfully he didn’t do that. I’ve played it about a dozen times and it gets better every time. I’m looking forward to continuing to watch Mensa’s development.